Course Overview is Now Available!! Hole by Hole Coming Soon!! Coming Soon - You can stand on almost every tee and play to multiple greens on the front nine. 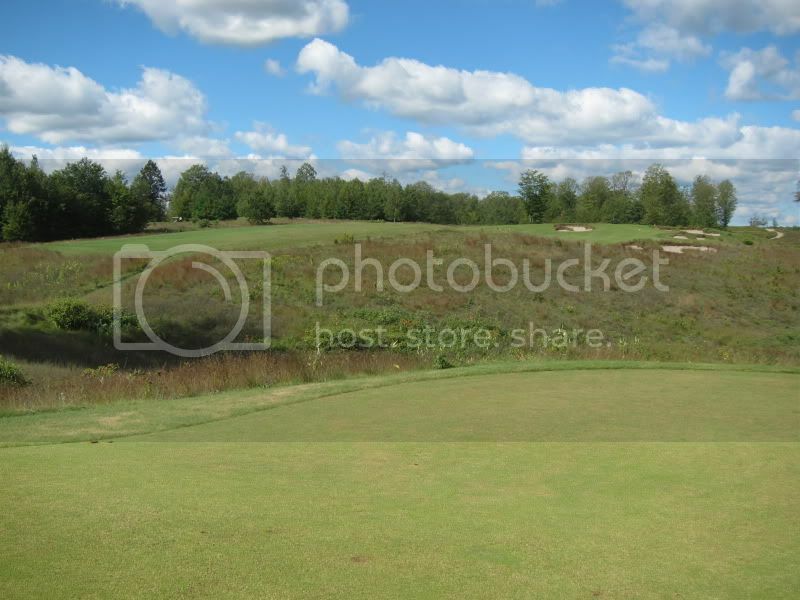 Find out which hole is featured this trip! Coming Soon - One thing you can count on for sure is that this will change every time I visit! 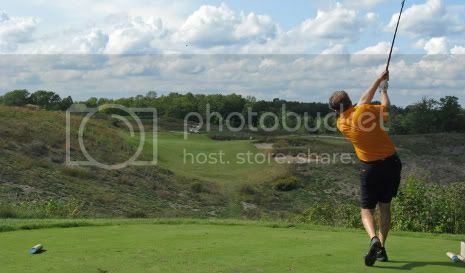 With the 2011 golfing season winding down to a close (I still have one trip left in me!!) I thought I would post a few of my favorites photos that I snapped this year. We'll start with the front nine. #1 from the blue tee on a beautiful day! #1 from the top of the fairway. Still a long way to go! #2 late in the season. The difference in colors from earlier in the year is striking. The 2nd green taken from near the 5th tee. 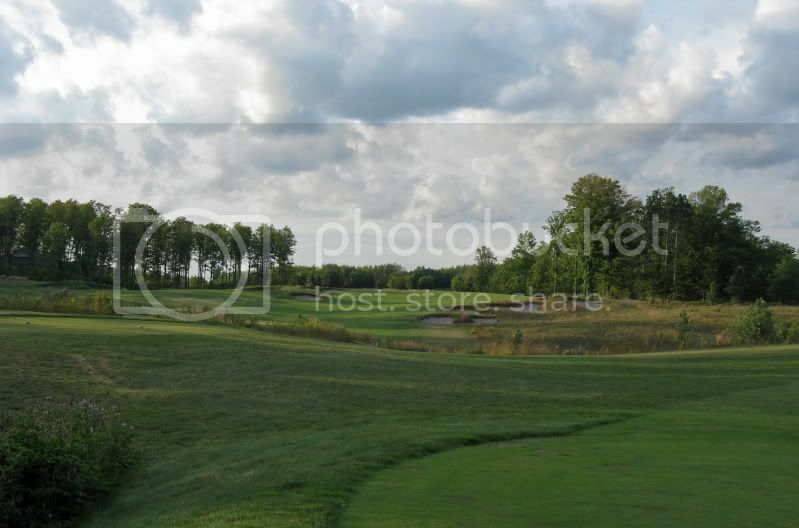 I'll add some more photos of the front nine, as well as a new post for the back nine when I return from my final trip. 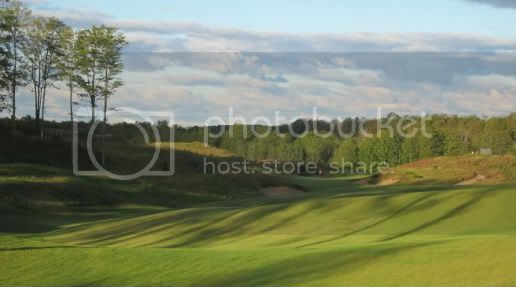 Hole #16 - Have I mentioned that the tees at Kingsley Club provide for remarkable variety? The 16th is more of the same. The gold tee here plays a challenging 225 yards. Depending upon the wind, this hole can be a driver for me. 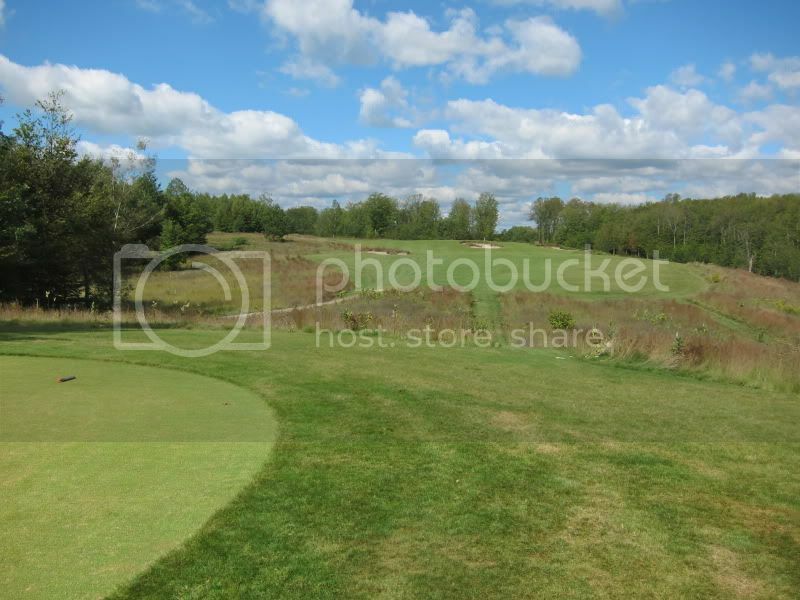 This hole was really designed for this tee in my opinion because the ideal shot to play is a low runner to the right of the green that feeds down to the putting surface. 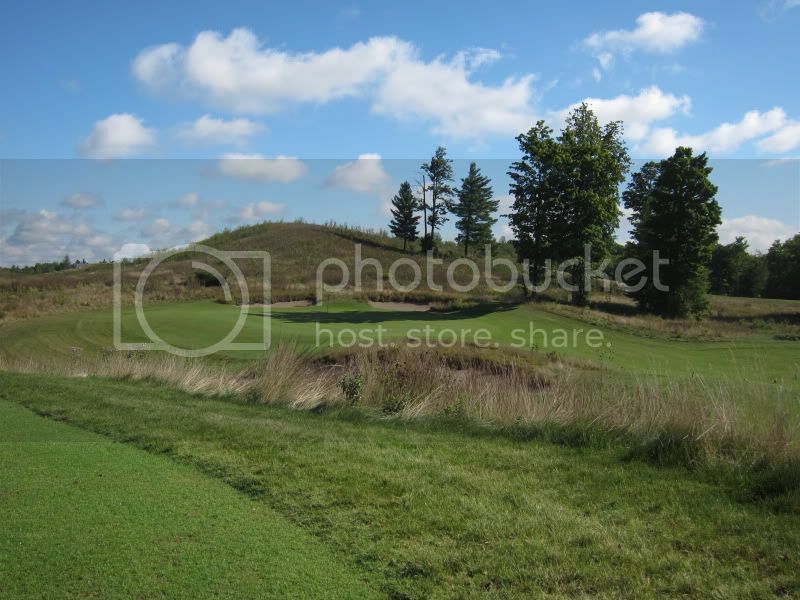 The blue tee plays 175 yards and presents another nice opportunity to play a low runner. Rather than taking your 175 club here, take an extra club or two, choke down, and watch it run to the green! The white tee is less elevated, more level with the green or perhaps slightly below (my memory fails me). The distance is 154 from the white tee. Finally, the red tee is only 138 yards. From this tee, the low runner no longer feels like the right approach though it is still an option. 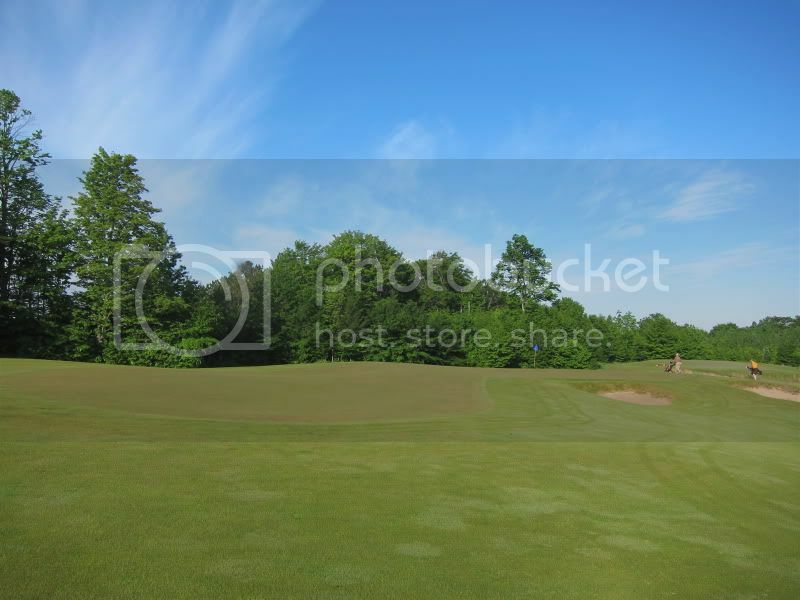 The green is large enough that with a short iron or wedge in hand most golfers will try to fly it to the green from this tee. I seem to recall the green being completely blind or at least mostly blind from this tee. Just make sure to miss a bit right and/or long of your target. 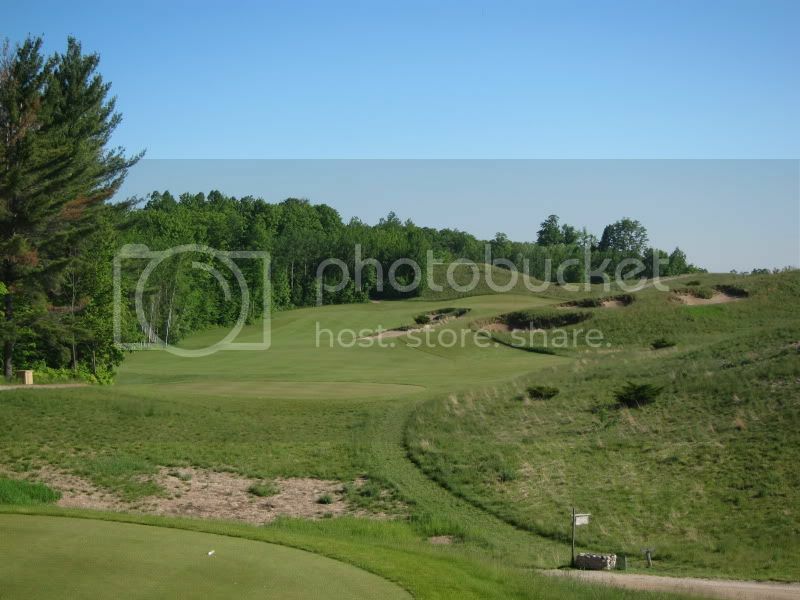 Hole #17 - This is the shortest par 5 on the golf course, playing 522 yards from the gold tee. It appears that there is a new tee box being built, which will stretch it out a bit more. Still it will need to expand a full 50 yards to exceed the 7th in length. The new tee box might be close to that distance but not much more. From this tee the roller coaster turbo boost is only in play for longer hitters or when the wind is really helping. I really have no hope or dream of making the crest of the hill from here. All of my playing partners had enough distance. 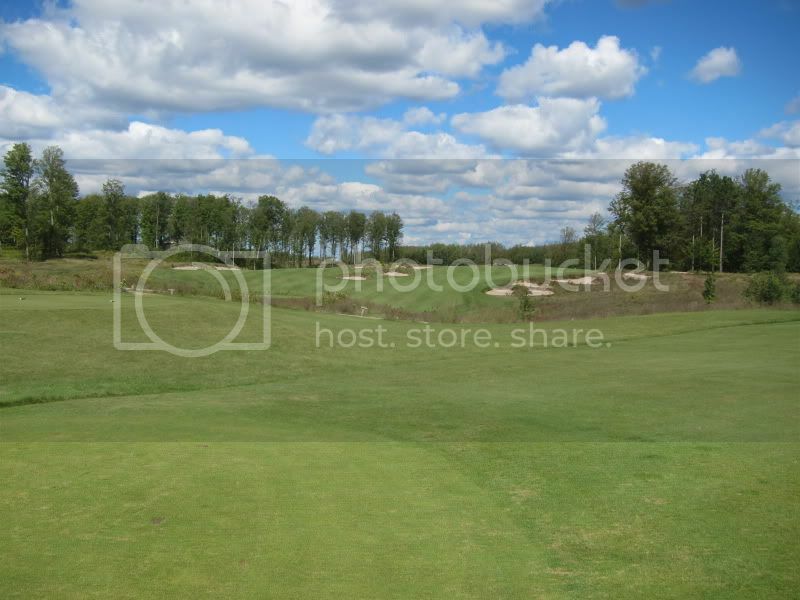 The blue tee and the gold tee play from a similar angle but different distance. 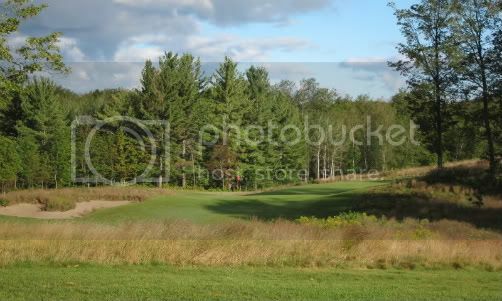 The white tee box can be seen in the left edge of this photo. The red tee is even shorter, but also to the left side. 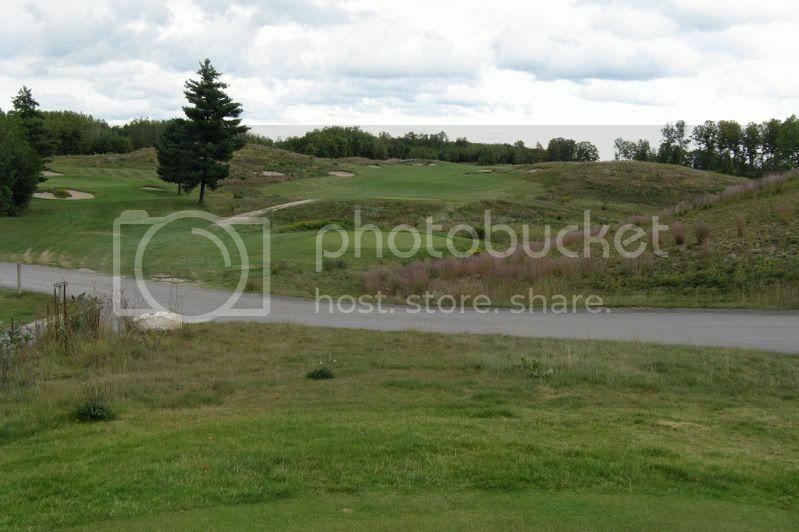 The blue tee plays only 476 yards, and now gives me a fighting chance to make it to the hill with a well struck drive. Actually, my finest drive on this hole was en route to making the journey down the hill until it struck the “no carts” sign with an authoritative “thwack!” The white tee plays 445 though most players that clear the hill from the blue tee probably won’t end up too much further down the hill with their drives on the white tee as they may fly over some of the turbo boost and get less kick. The red tee plays 412 and makes for a nice par 4 for the big hitters. For players like me, it just results in one more humiliating chance to make a 6. 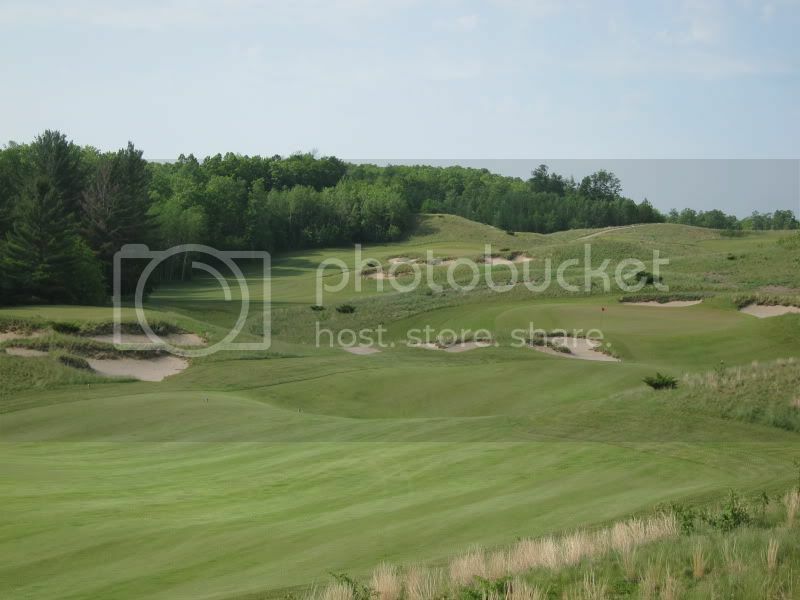 In this photo of the 17th tee, you can barely make out the red tee between the bunkers on the left edge of the fairway and the bunkers in the middle of the fairway. 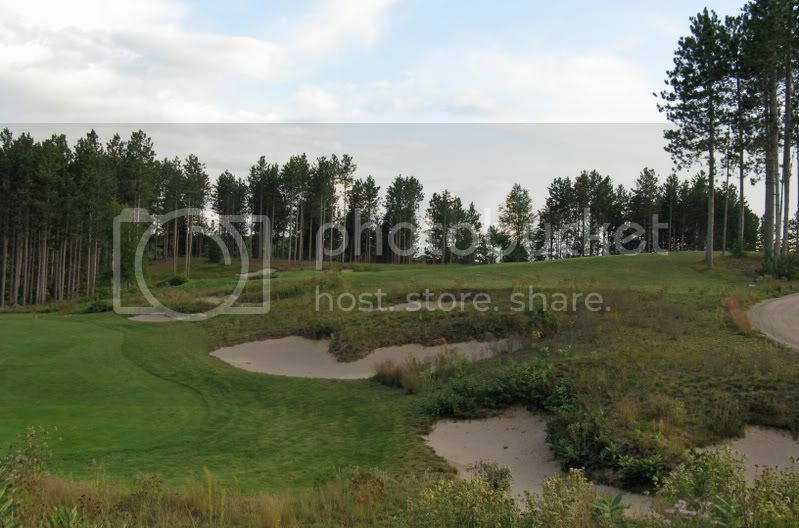 Hole #18 - The final hole at Kingsley once again comes through with some nice options, particularly for a match that makes it to last hole of the day. The gold tee plays at 422 yards. 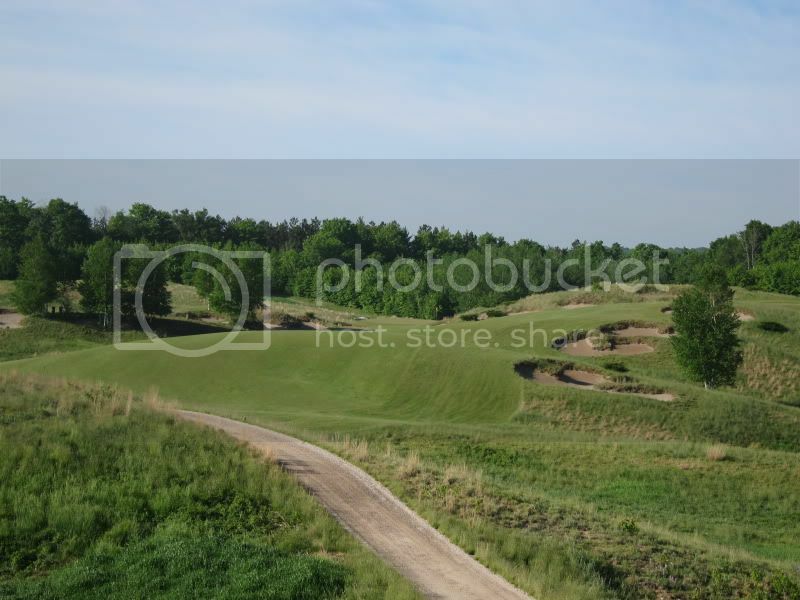 With the rolling fairway that could help or hurt a tee shot combined with a testy approach that will likely be played with a mid-to-long iron or hybrid from the gold tee, this hole can be a brutal finisher. Getting your ball in the hole might well prove to be enough to win the match. 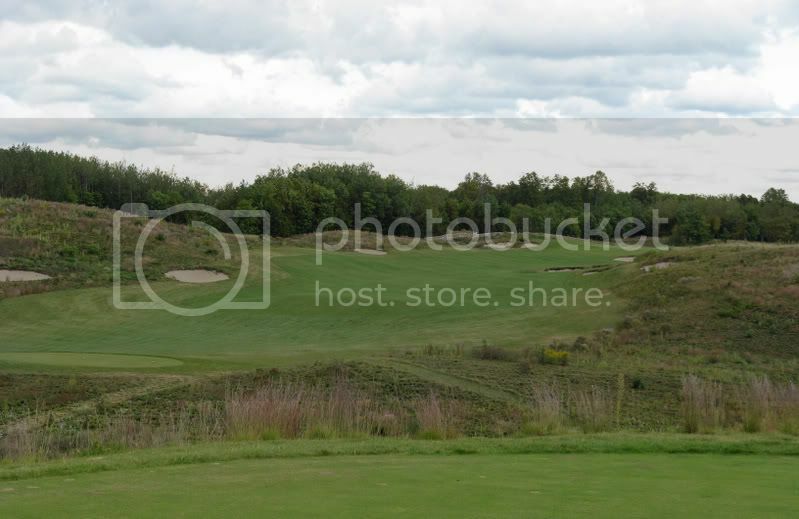 The blue option at 386 yards is played from a similar angle as the gold tee but it cuts off just enough distance that the approach plays to a reasonable length for the hitter without too much distance. From the blue tee, the white tee can be seen just across the road. The red tee is well up and to the left. Up a bit more, the white tee also presents a good option at 360. Now we are talking about different club options off the tee or a chance to play to the difficult green with only a wedge for many players. 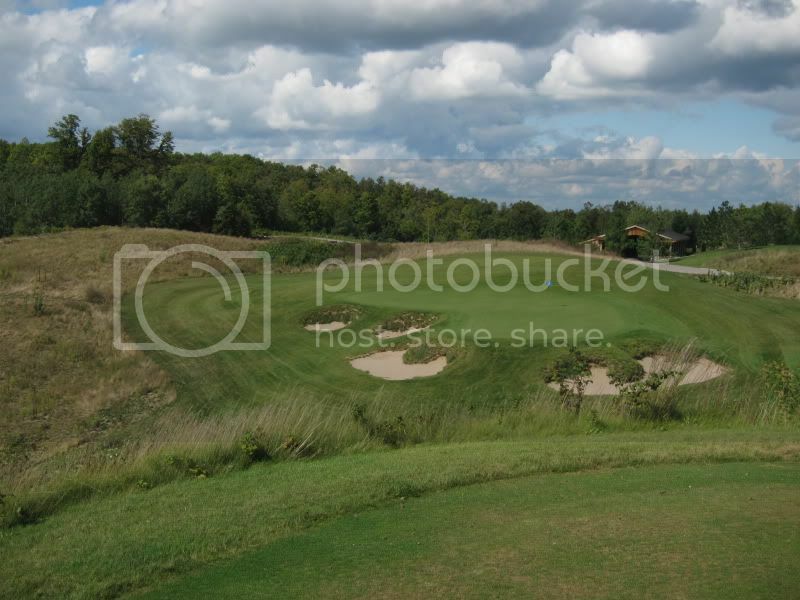 Last but certainly not least, as it pertains to match play interest, is the red tee at 292 yards. Why shouldn’t you finish the occasional match from this distance? 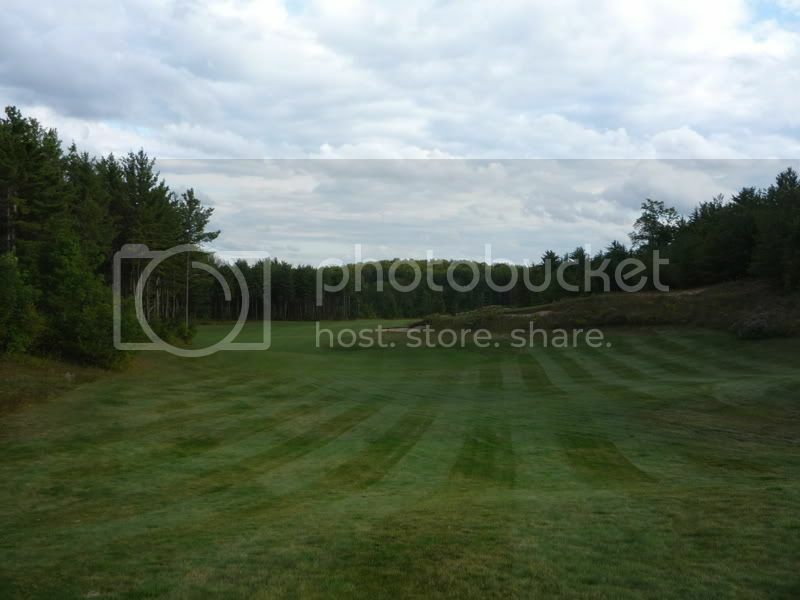 This tee is positioned well forward and also well left of the other tees. There’s too much trouble guarding the green for most players to think about realistically driving the green, but it certainly puts the driver option in play for the player with their back to the wall on the 18th. 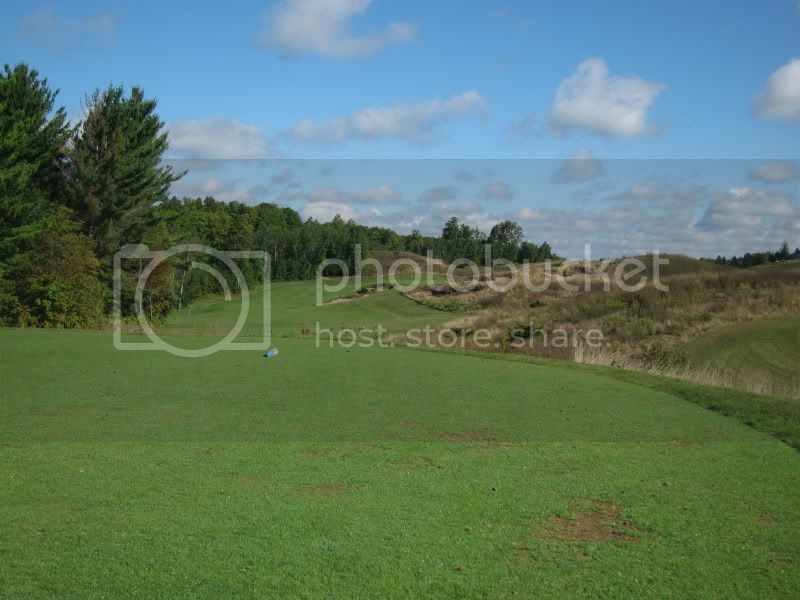 It also yields the opportunity to play a fun pitch shot to a green complex that is no bargain from any distance. The red tee can turn the 18th into an exciting short par 4 finish. The angle is also very different from the red tee. Choose your club wisely! 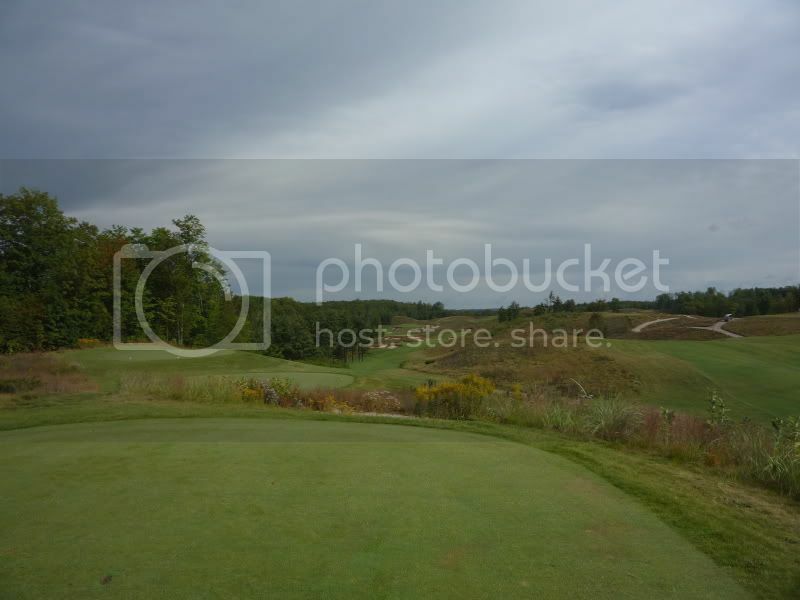 golf tee, which is usually found up on the far left teeing ground. 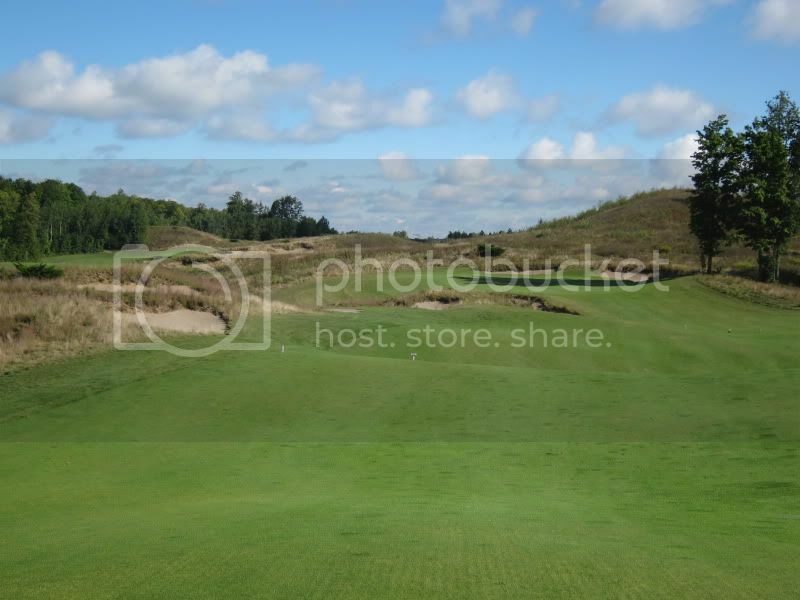 The blue tee plays 271 and typically plays from the far right side, providing a much different look and angle to this short par 4. The white and red tees are again combined at 246 yards. They are played from a similar angle as the gold tee, though close enough that many players will opt for something less than driver (not me!) even if they are going for the green. From the white and red tee the fairway is much more visible. Hole #14 - The 14th takes the prize for most distance between the gold tee and the red tee. 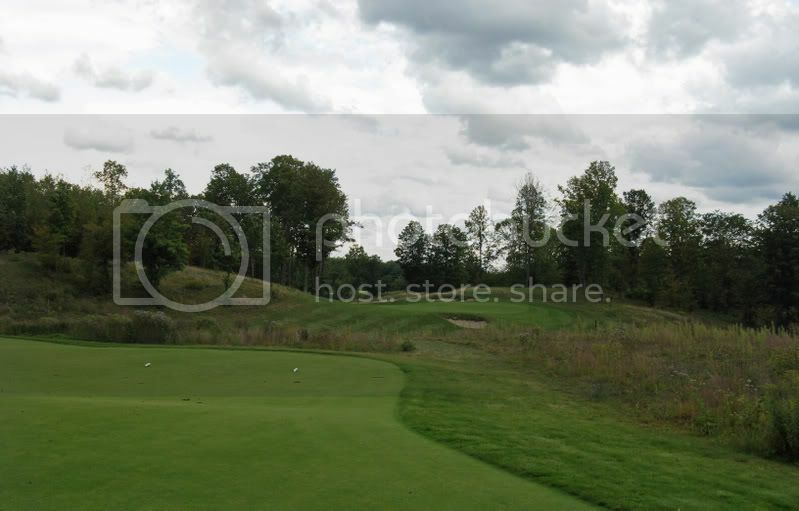 With a full 170 yards separating the two tees, the tees on this hole also provide a host of flexibility and excitement for the repeat player. The gold tee on this hole is 615 yards. I have only hit one tee shot from this box and I am fighting just to make the fairway from here. The “carry bunker” on the right side of the hole is out of range for me here, so I’m just hoping to hit the left side of the fairway near the trees from this distance. The blue tee provides a much needed reduction in distance here at 510 yards. Most players electing to play the blue or green tees will now be able to challenge the bunker from the tee in order to be rewarded with a turbo boost. In addition to being 100 yards shorter, this tee plays out to the left of the gold tee, which helps with the angle. The view from the blue tee. 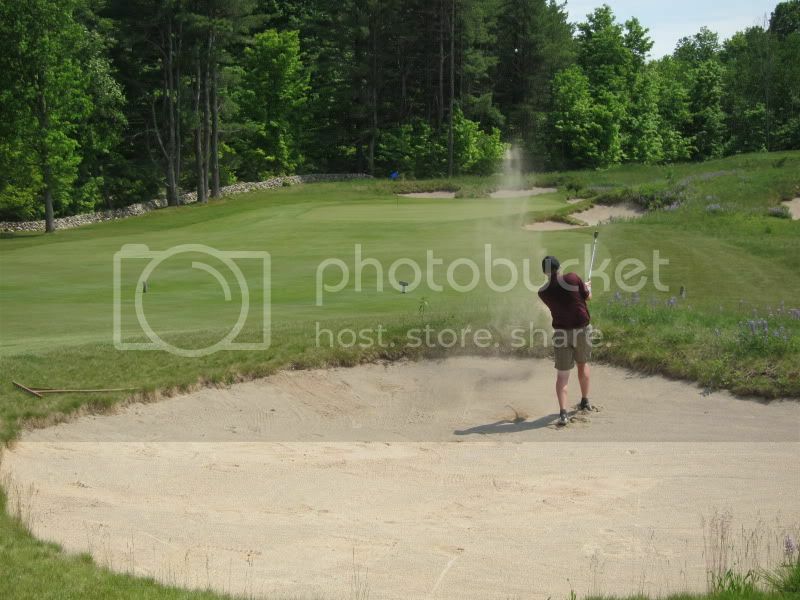 Carrying the bunker should be an option for most players electing to play this tee. The white tee is listed as 466 yards and the red tee is listed as 445 yards. If my memory serves correctly, there are three additional tee boxes short of the blue tee, so I’m not 100% sure which serves as the normal white tee. There is one box a bit to the left, mirroring the blue tee angle. Then there are two shorter tee boxes up by the fairway and to the right. 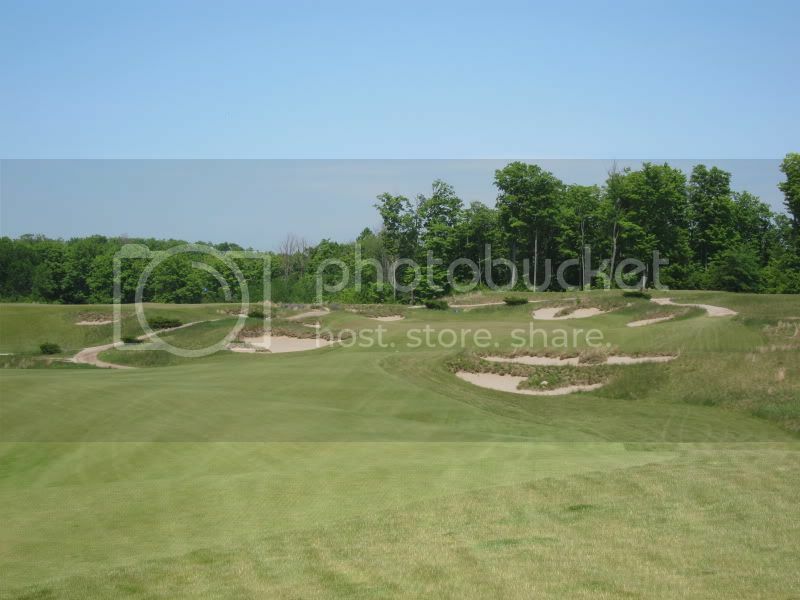 From these tee boxes, the carry bunker shouldn’t be an issue other than the tee shot is struck from a lower elevation than the bunker and now even more of the landing area is blind. The white tee presents a much less imposing view. The red tee is a bit forward and to the right from here. The red tee is a nice combo to play with the 15th gold tee if you want to turn #14 into the par 4 and #15 into the par 4 - or just play them both as a 4.5 as they should be played! The blue tee provides a bit of relief at 421 but it loses a bit of elevation from the gold tee making the drive a bit more uphill (at least it feels uphill). The blue tee eases up a bit from the gold tee, but it isn't a picnic from here either! The white tee and red tee are available for options once the golfer has been beaten into submission numerous times. The white tee at 408 yards is still no bargain. The red tee is only 370. Despite the fact that I love playing so many of the par 4 holes at Kingsley as short par 4s from time to time, something just doesn’t feel right about moving up to the red tee on this one. Some of the other hole are exhilarating and fun from the red tee. This one just feels like giving in and cheating! It’s now been over a month since my visit to the Kingsley Club. Previously, I had written about the anticipation leading up to the trip. The offsetting post-trip ennui has allowed me the opportunity to procrastinate in documenting some thoughts on my visit there. This time I got to spend four whole days there, and I noticed some things that I missed when I was only there for one day before. While I had hunches on the culture from my first trip there, a few points were really driven home to me this time. First, the genuine friendliness of the staff was abundantly clear. I arrived before my host, and they made me feel welcome as if I was the member. There is something different about the feel of this club in comparison to the club I was a member at and other clubs I’ve visited. The best way I can describe it is that there is a total void of pretention, where many other clubs are havens of pretention. Another way of saying it might be that they treat you the way they do just because it is the right thing to do. I get a feeling that few people working at the club are actually “working”; they’re just doing what they enjoy doing. And for me that elevated the experience. I remembered the remoteness of the club and the dirt road leading to it from my first trip. But I didn’t realize how alone you could feel on the course. There were obviously other groups out, but many times we felt like the only ones on the course. And that makes for such a pleasant experience compared to many resort courses where you feel like someone is right on top of you, whether that be other groups or the course ranger. 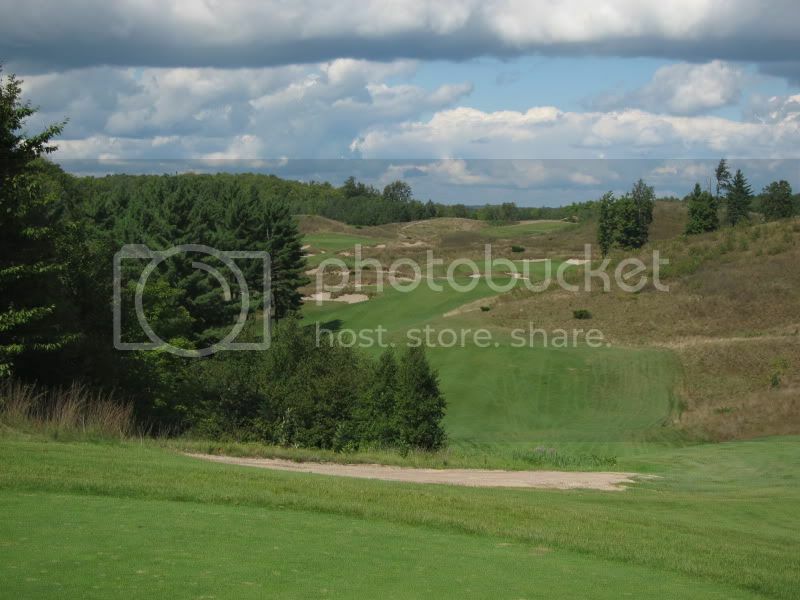 Playing Kingsley is retreat golf; you are truly getting away from it all. Despite all the golf we played (my tally was 31, 43, 54 and 36 holes over my four days), I was really refreshed at the end of the trip because there was nothing else to worry about. My brother’s miracle tap in par on #4 (topped drive into rough, hack out barely to the fairway, 7-wood to 1 foot). The Kingsley Golfer’s birdie-less streak and how towards the end of the trip he’d get irked when someone else made one. Jason McOlgan’s quest to post a real score for a round without at least one hole where he’d pick up. My near hole-in-3 on #3 from the red tees. My brother driving #3 and #4 in succession from the red tees. My being in the right fairway bunker a little over a hundred yards from the green on #14. It now has the unofficial title of “Gard Bunker”. The Kingsley Golfer complaining about playing from the gold tees but still parring #1 and #10 in our only times playing from them. I’m sure we’ll be discussing these and others for many years to come. Once again, I sincerely thank the Kingsley Golfer for allowing me to return to the Kingsley Club. I appreciate the course and the Club itself even more after this trip. 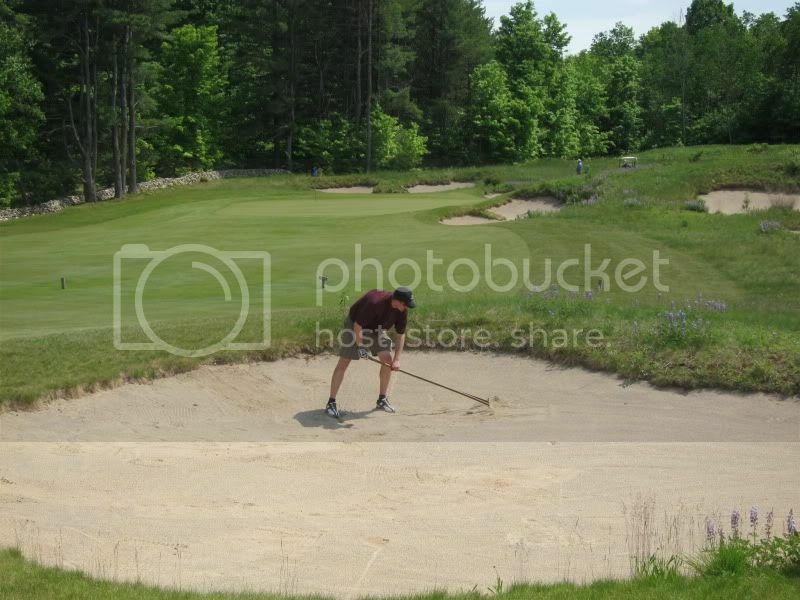 It is always wise to rake thoroughly when you know that you will be visiting the very same bunker later in the day. Hole #10 - The gold tee on the 10th hole is the first of three brutish options on the back nine for those with a soft spot for long par 4 holes. The gold tee plays 446 and is located across the road back near the practice range. The 10th is a monster from the gold tees. 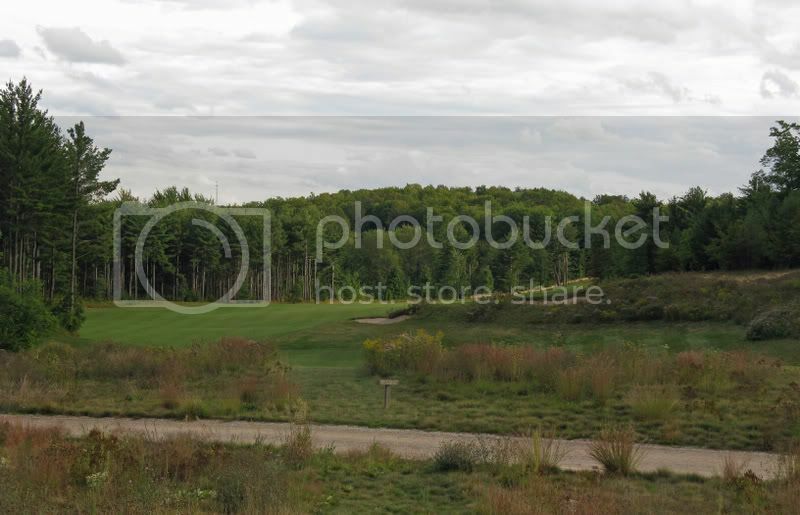 The white tee box is seen in the distance. The blue tee is to the right on the top of the mound seen on the far right. With the swirling winds we faced on our recent trip this hole was just as likely to play with a tailwind or a headwind, often times changing with each shot! One of my favorite moments of the trip was when I caught a nice one from the tips on #10. While the ball was in the air, I got an “attaboy” from one of my playing partners... only to see the ball fall short of the fairway and come to rest in the rough! The blue tee weighs in at 393 and plays from a angle more to the right. This tee is located a little more conveniently to the clubhouse, which is how I rationalize avoiding the gold tee whenever possible. 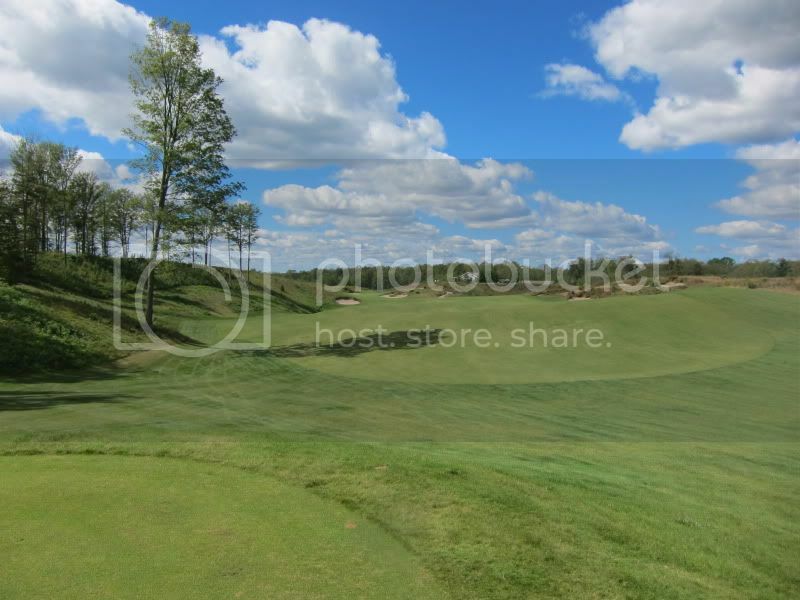 The blue tee provides a different angle than all of the other tee boxes on the 10th. Seen to the left is the red tee box. The white tee makes the hole an even more manageable 364. 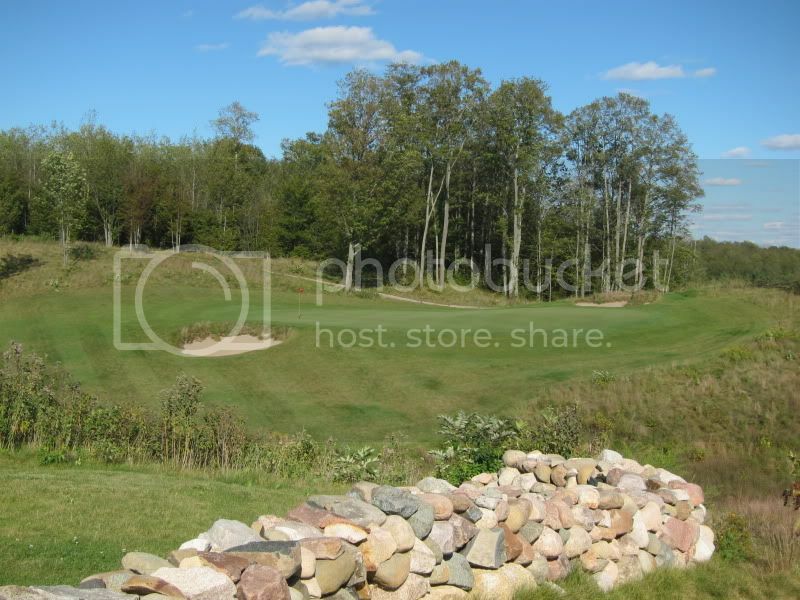 This tee is located back down to the left of the blue tee. Finally, the red tee presents yet another option for a 300 yard par 4. Hole #11 - The gold tees really start to show their teeth on the back nine. 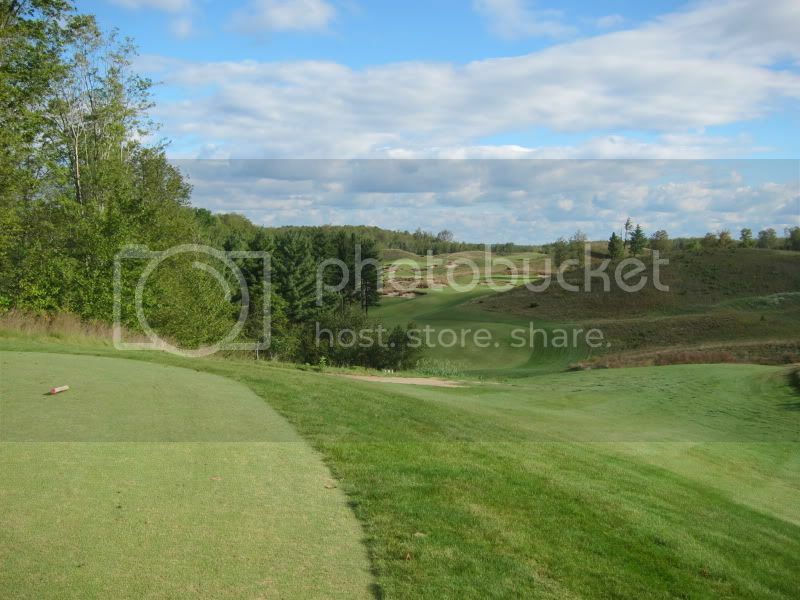 While there is only 160 yards difference between the gold tees and the blue tees on the front, there is an astounding 320 yards difference on the back nine! 90 of those yards come on the two par 3s; 40 of them coming here on the 11th. The gold tee at the 11th is listed at 180 on the card. 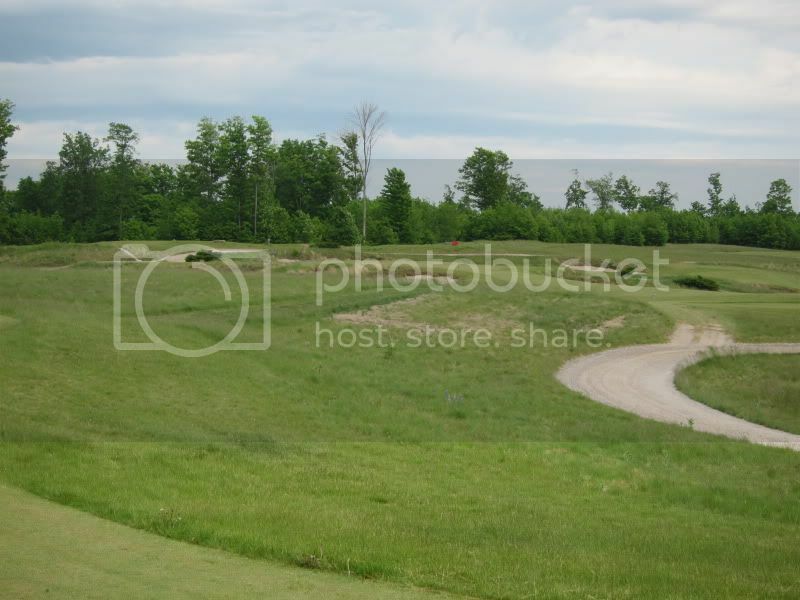 The blue tee plays from a similar angle, yet a much shorter 140 yards. The blue tee on the 11th hole. The gold tee plays from a similar angle but much longer. The white and red tees are forward and to the left. The white and red tees are off to the left creating a new and fun angle for the player. Those tees play 121 yards and 114 yards. Hidden Gem: One of my favorite “hidden” tees is to play the 11th hole from the 18th tee. 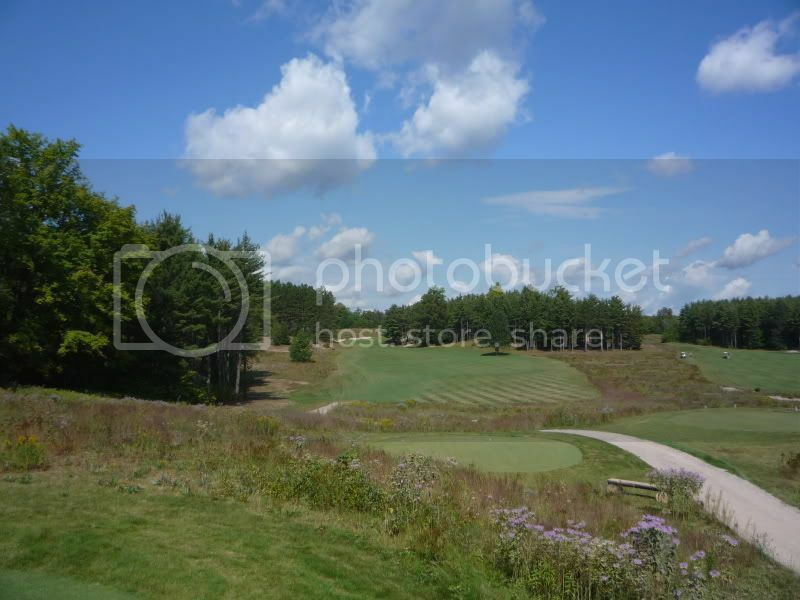 It can be played from the 18th gold tee at 100 or less yards, with the green in full view or from the 18th blue tee at 120 to 130 yards to a mostly blind green. This angle turns what I’d call a “false side” of the green from the normal tee into a pure false front that must be challenged. Playing the 11th from the 18th tee is a fun treat when the pin is located front left. 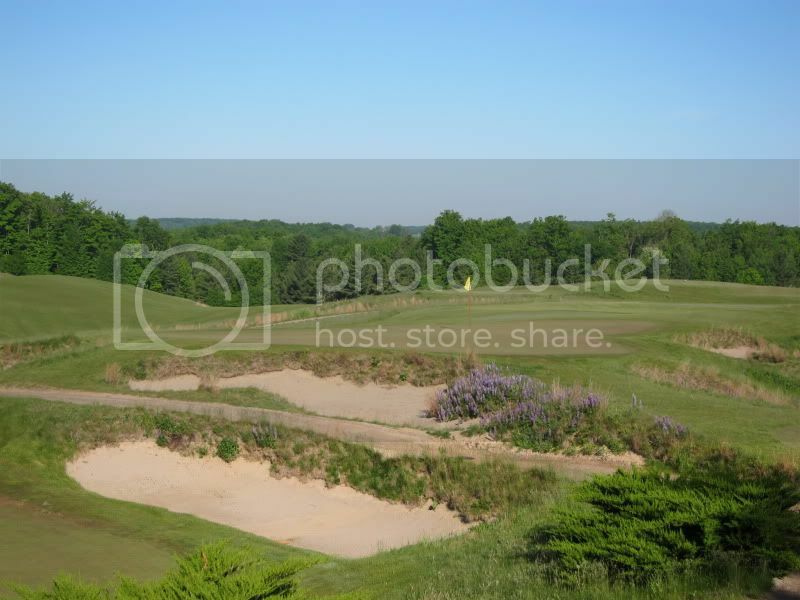 This brings both the false front and the small bunker into play. 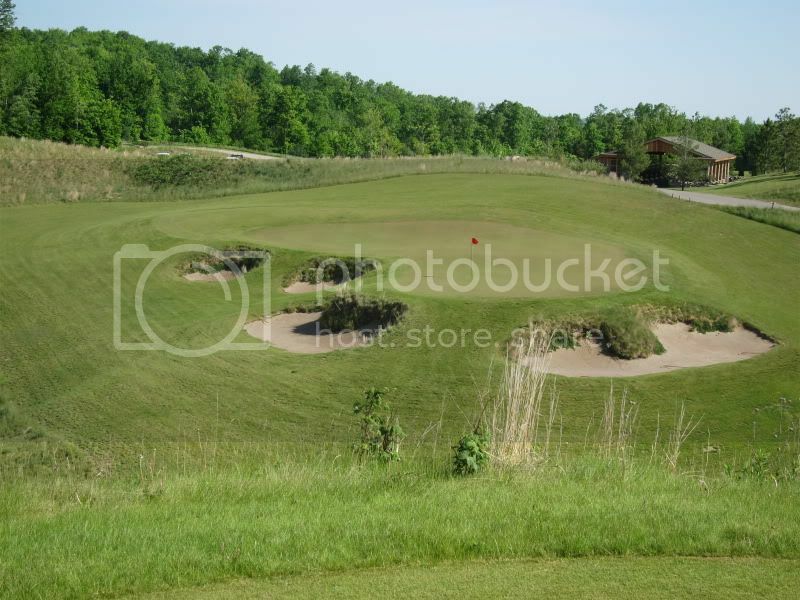 Hole #12 - Another hole that stretches into a beast from the tips, the gold tee here plays 455. The 12th tee is elevated and will often play downwind, but this is probably the most challenging drive on the course. 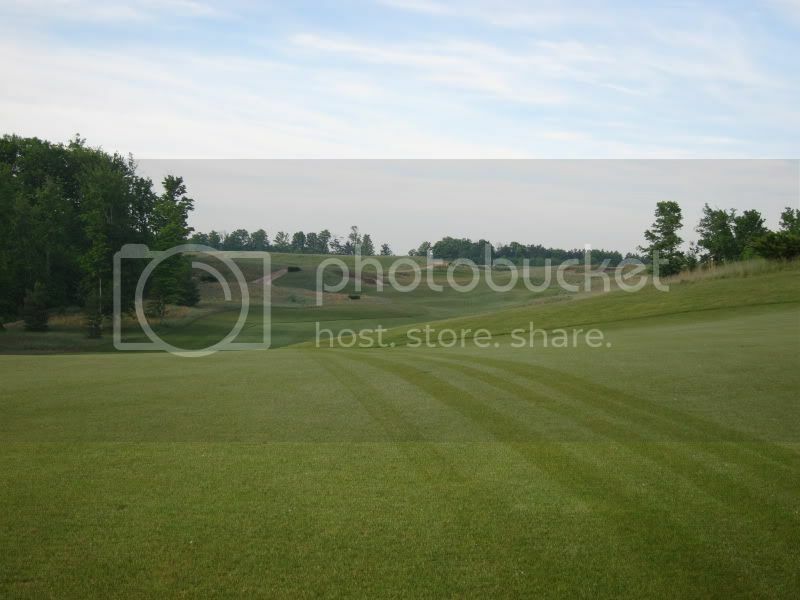 The fairway plays to a slight diagonal from the tee with some of the most penal rough on the course awaiting to the right for the player that challenges too aggressively. There is more room than what appears to the left, so there’s no excuse to miss right. The longer the summer wears on, the longer this rough gets. When you miss right in September make sure to bring a search party with you! The blue tee is still a stout test at 425. 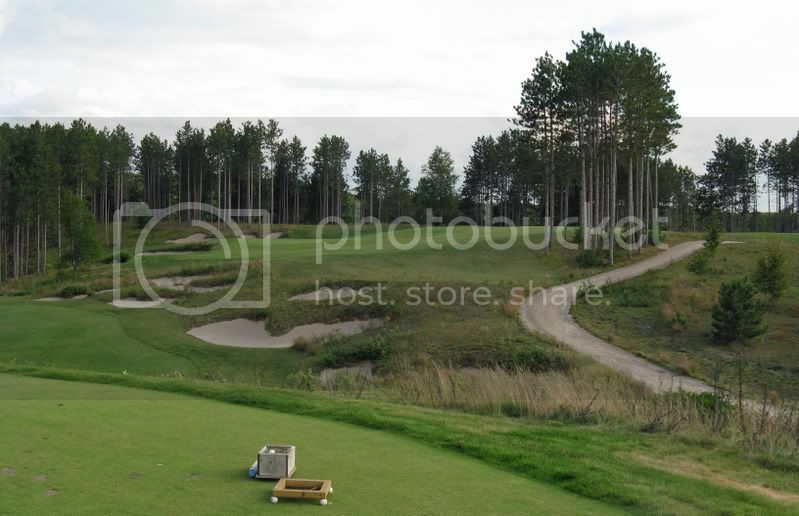 The tee box is slightly less elevated than the gold tee box, and the angle is fairly similar. The scene of the blue tee on the 12th hole. The gold tee is directly behind, though a much tougher battle. 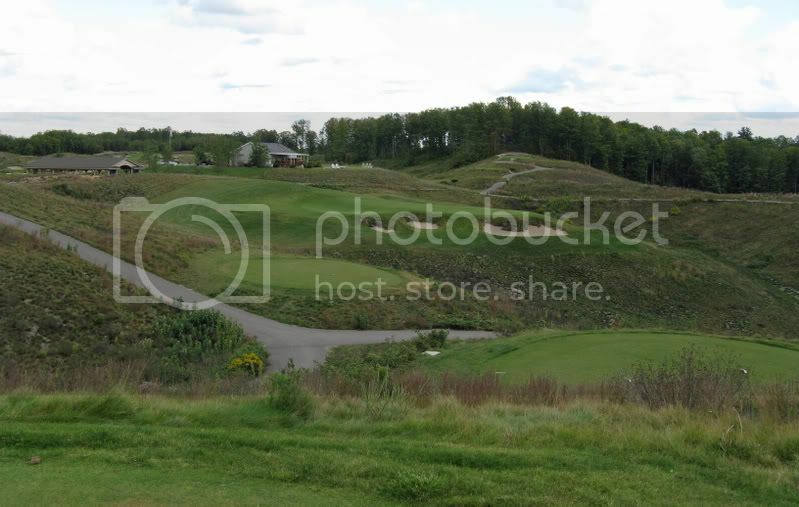 The white and red tee boxes and be seen in the distance on the left. The white and red tee boxes sit together at 335 yards. These are down the hill a bit and much more to the left, not only reducing the distance but also giving the golf a straight down the chute view of this hole. The short tees are fun to play when the wind is helping as you can really put the ball down close to the green with a well struck shot. 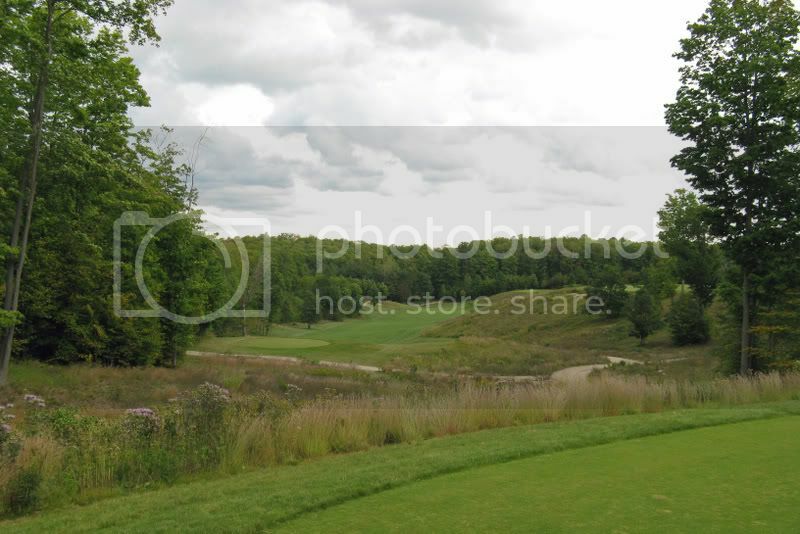 Hole #7 - The 7th hole is a wicked tee shot no matter which teeing ground is chosen. The gold tee (569 yards) is one of the least comfortable for me on the front nine. The fairway, which is partially hidden from view no matter which tee is selected, seems very distant due to the blindness. Also, from this tee box, my weak left-handed fade swing brings a lot more trouble into play. I really need to strike it solidly from this tee in order to put the ball in play. The blue tee plays 512 yards. From this tee many longer hitters will be opting for less than driver in order to take the long rough through right side of the fairway out of play. This is a perfect tee box for me to swing a full driver unless there is a strong helping wing. The white and red tees share a tee box and play about 490 yards. 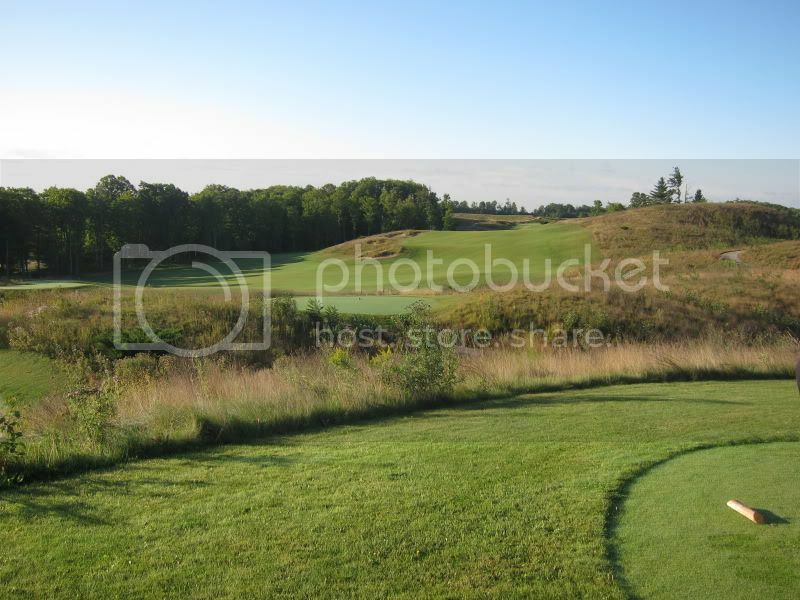 From this tee, the long hitter is tempted to cut the fairway corner with a driver. The landing area and the penalty for a miss is rather severe, but I don’t think this tee box holds much interest for the stronger player unless they plan to make a run at this carry. For me, the white tee plays as a hybrid off the tee to the same target as the blue tee. The red and white tee boxes. The big hitter will be tempted into all kinds of disasters from here! There is a REALLY forward tee that is in the process of growing in on the 7th hole. I’m not sure if this is a future location for a red tee, but it looks like great fun to me as it is far enough forward that even I’d be tempted to try and blast it over the corner with the driver. The best part about playing aggressively and missing right is the view of the 7th and 8th holes from above. 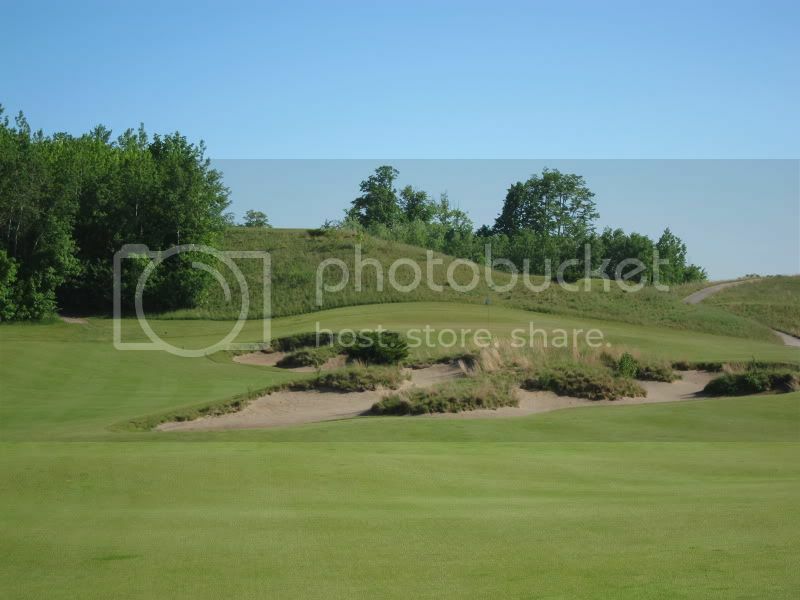 Hole #8 - There’s not too much difference between the gold tee and the blue tee on the 8th hole. Fortunately, the fairway, approach, and green offer plenty enough variety to keep the 8th full of interest. 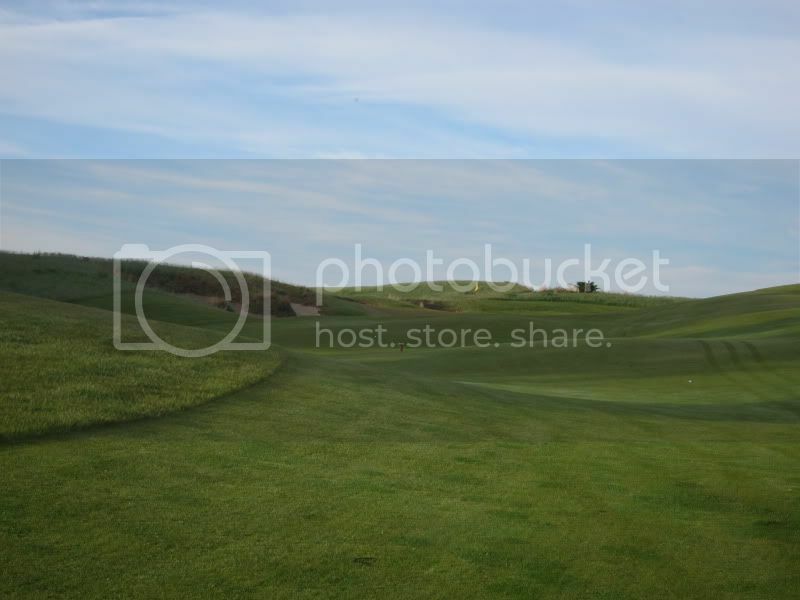 The gold tee plays 365 yards and the blue tee plays 349 yards. 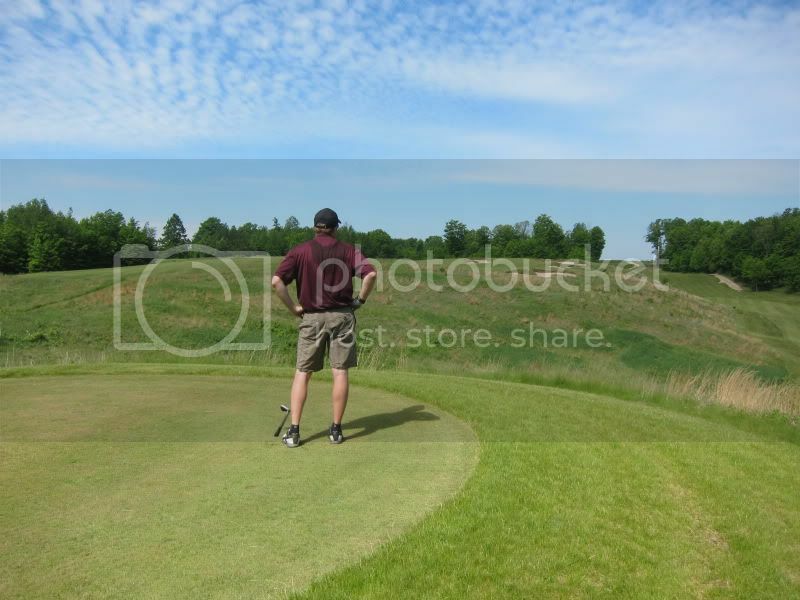 This photo was taken from the blue tee box. The white tee can be seen to the left. The red tee is also visible in the distance. 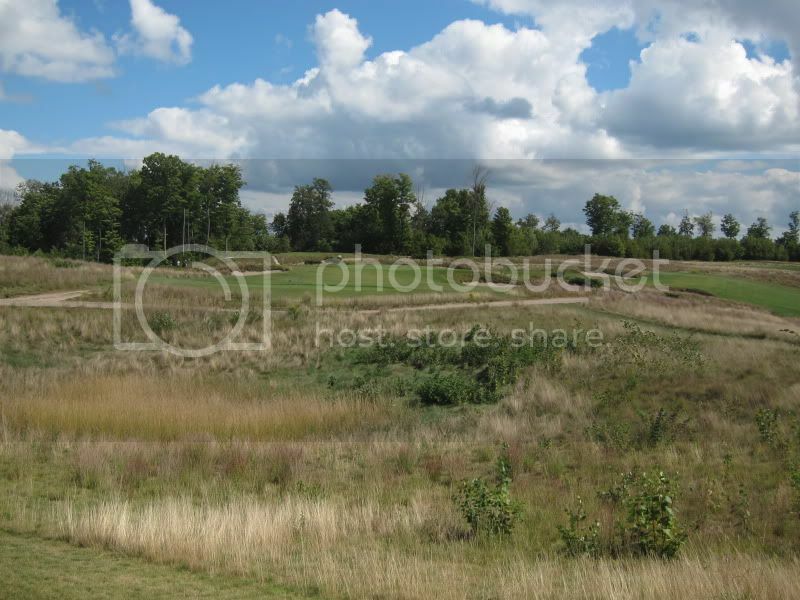 The white tee is only slightly forward, at 321 yards, though this tee box is slightly less elevated. The white adds the interest of bringing the center fairway bunker even more into play, making club selection a tough choice. From the red tee, the 8th hole can be played at 251 yards, making this the fourth hole on the front nine that can be played as an extremely short par 4. As one that enjoys a good, challenging short par 4, I really enjoy this flexibility. 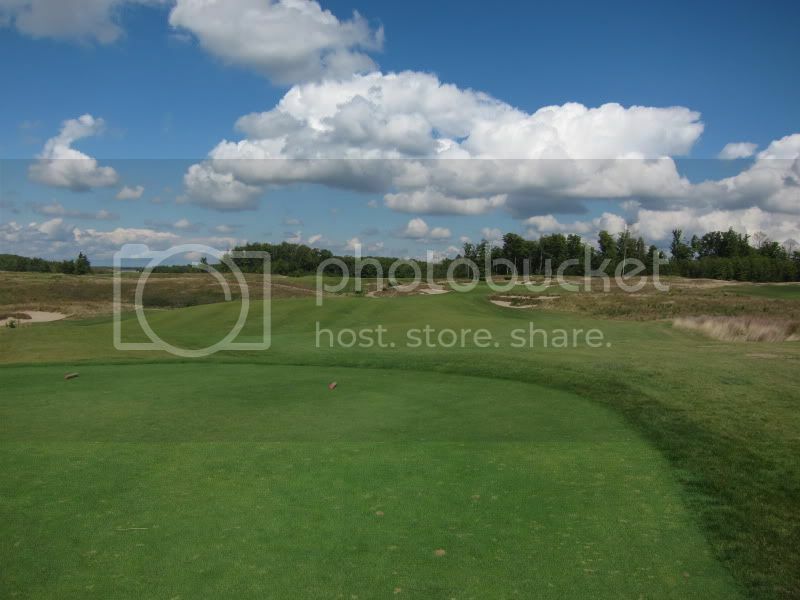 Each of the four holes offers enough challenge that even from inside 300 yards, birdie or par is not a certainty. 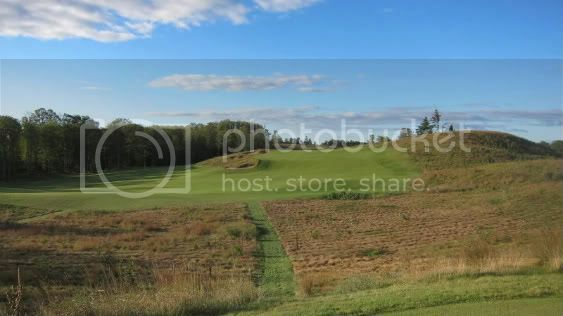 While I probably wouldn’t want to play all four of these holes from this short distance in the same round, if I happened upon any of the four on another course playing this distance from the normal men’s tee, I’d probably be elated at the exciting short par 4 option. The fact that you can mix and match here and choose your own is a real bonus! Hole #9 - The front nine is rounded out with the ultimate hole for teeing options. Looking back on the 9th. The West tees are to the far top right of this photo. The South tees are to the far left of the photo. I’ll probably botch the distance and the directions here, but I believe the tee boxes are known as the “South” and the “West” tee boxes. The gold and the blue tee boxes from the South gives this hole more teeth than any other options. The South set of tee boxes are off to the right of the 8th green and put the 9th green directly in line between the 9th tee box and the club house. The West set of tee boxes are located up and behind the 8th green and put the 9th green in a line between the 9th tee box and the 1st tee. The gold tee from the South set of tees is more than enough for just about anyone on this hole. The card says 171 yards, but I think the marker on the box is more like 160. It is a long, all carry, uphill battle to the green from here. There’s no real ideal pin position from this tee from my perspective. 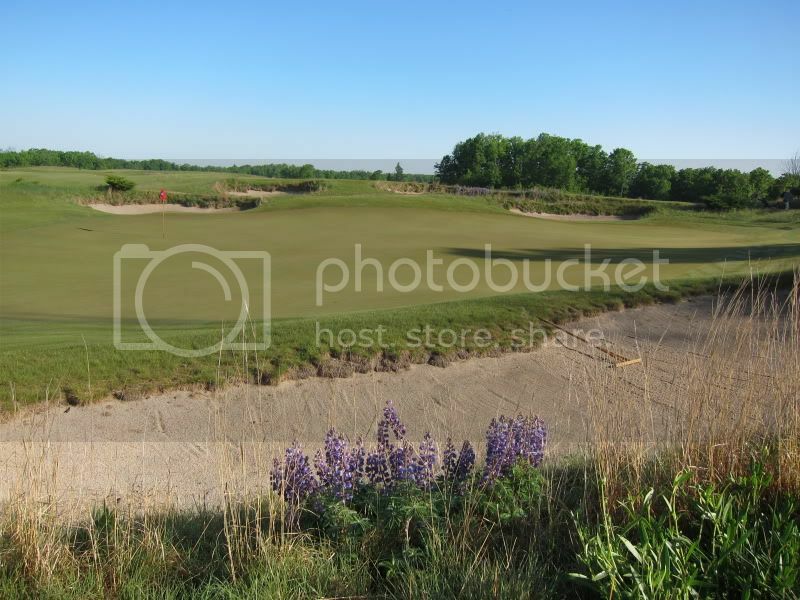 The gold tee from the West set plays somewhere in the neighborhood of 135. This is an elevated view down to the green. 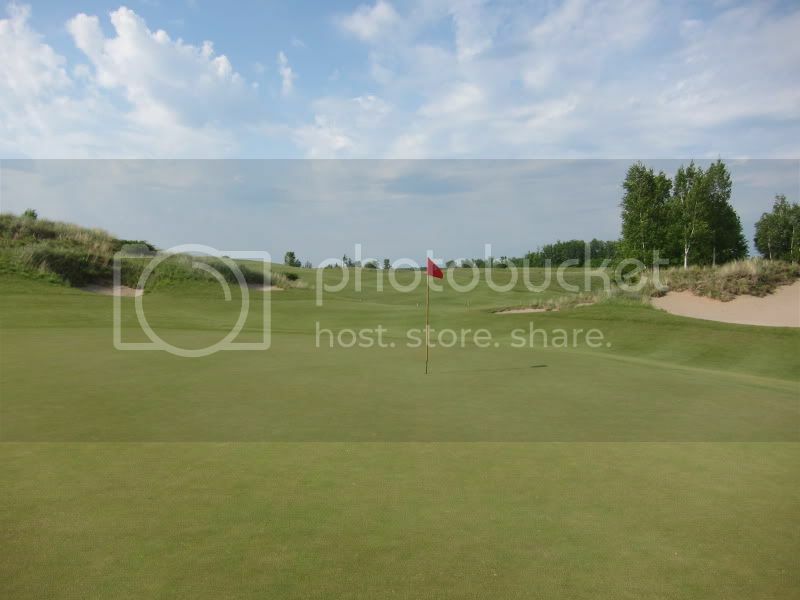 The pin on the West wing is very accessible, though a miss slightly left of this pin position could results in the ball running fully off the right side of the green. The pin on the South wing demands extreme distance control to a sliver of a green that is only one club deep from this tee position. The blue tees play from similar angles as the gold tees. From the South set the blue tee plays about 130 yards. This tee is a bit more elevated providing a slightly better view. From the West set the blue tee plays 120 to 125. The view from the West set of tees. Standing on the blue tee box, with the white and red tee boxes visible in the foreground. The white tee plays around 100 yards or so from both sets of tees. 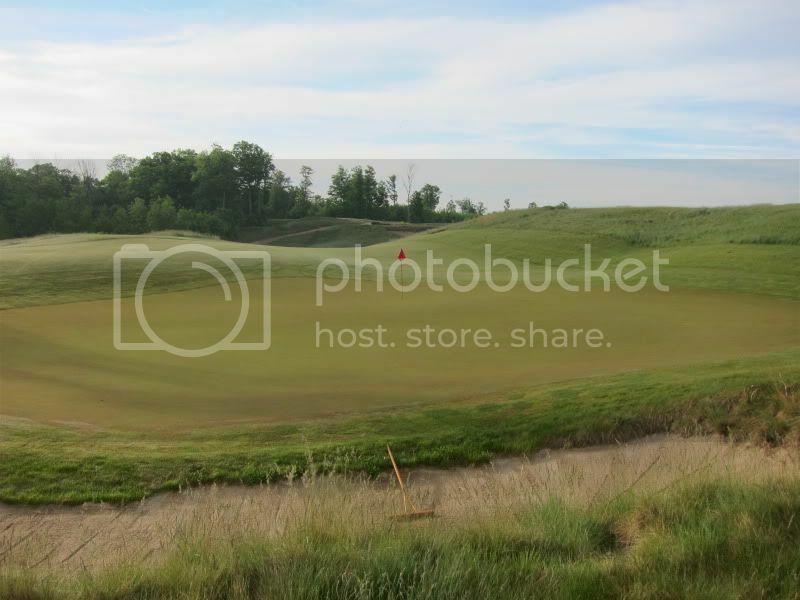 From the West set, the red tee box is probably only 75 and it makes for a fun pitch shot that tests your distance control with a partial wedge. From the South set, the red tee sits high upon a “mountain.” The tee is perched well above the green and plays probably 95 to 100 yards from here. 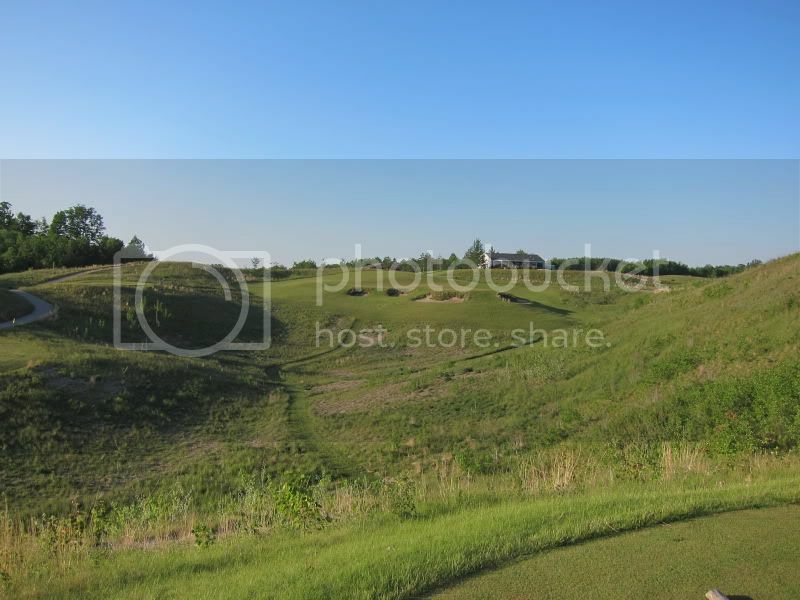 As with some of the other short tees on the course, this tee box is a must play, even if it is in the late evening while playing a few bonus holes. The red tee is the most elevated tee option on the 9th hole. This is probably the easiest location to tee it up on the hole. Still, it is a fun shot and no bargain from here. This is a Kingsley photo slideshow set to music created by yours truly. Watch it here or click on the YouTube link to view a larger size and higher quality. Proud father. 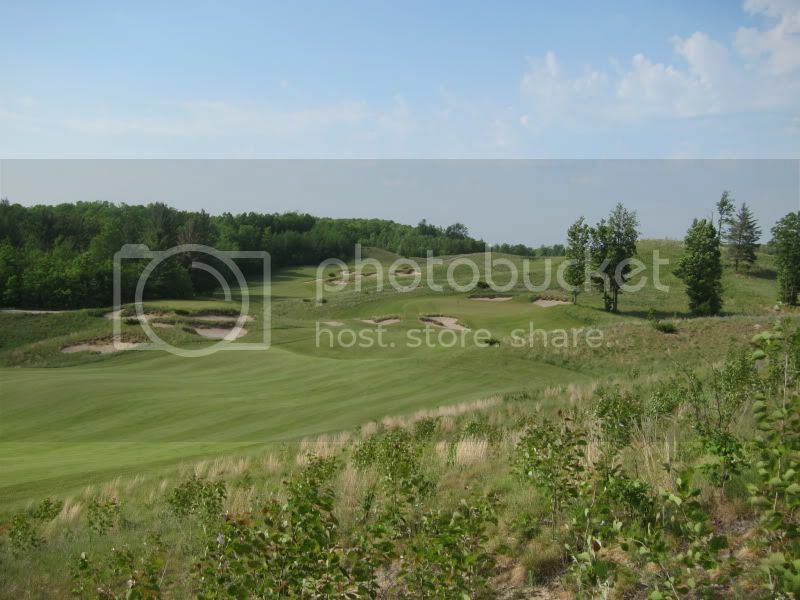 Golf course design, music, and photography enthusiast with a knack for numbers. Special places in my heart reserved for Philly sports teams and Kingsley Club.